Tax books open March 1st and are payable by October 15th of each year. Taxes can be paid in partial payments at any time as long as the balance is paid by October 15th. Tax payments must be post marked by October 15th to avoid penalties being applied. Payments may also be placed in the safety deposit box located in front of the Annex Building. Include your Tax ID and a self-addressed, stamped envelope to receive a receipt. 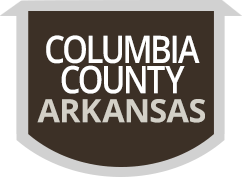 Processing Fee is charged by Arkansas.gov and no part of the fee is remitted to the Columbia County Collector.